Sandwich ELISA analysis of CD178 binding using Mouse anti Human CD178 (MCA2409) as a capture reagent and biotinylated Mouse anti Human CD178 as a detection reagent with purified human CD178 as antigen for the generation of a standard curve. Detection is by HRP conjugated Streptavidin and substrate. Microtitre plate is read at O.D. 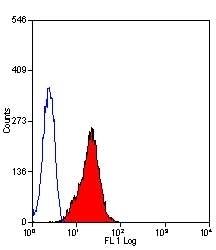 450 nm on the Bio-Rad iMark Microplate Absorbance Reader (Bio-Rad Catalog 168-1135). 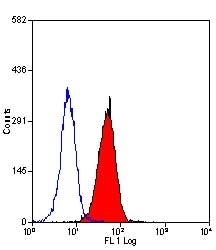 Plasma (orange) sample is displayed at 1:2 dilution. 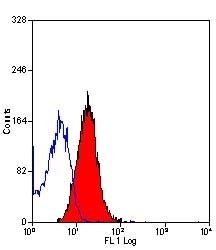 Mouse anti Human CD178 antibody, clone 14C2 recognizes the human CD178, also known as Tumor necrosis factor ligand superfamily member 6, Fas ligand (FasL), Apoptosis antigen ligand or CD95 ligand. CD178 is a 281 amino acid, a ~40 kDa single pass type-II transmembrane glycoprotein bearing a single intracellular FasL domain and member of the tumor necrosis factor family . CD178 is expressed by activated T lymphocytes and NK cells (Leite-de-Moraes and Dy 1997). The protein may exist as either a membrane bound or a cleaved soluble form (Garcia et al. 2013). CD178 plays an important role in T cell mediated cytotoxicity (Jodo et al. 2005). Binding of CD178 to Fas (CD95) results in the induction of apoptosis (Ju et al. 1995). Mouse anti human CD178 antibody, clone 14C2 is reported to recognize a conformation dependent non-blocking epitope on CD178 (Daburon et al. 2013). Spleen cells from immunised BALB/c mice were fused with cells of the P3U1 myeloma cell line. 1 Results maybe enhanced using membrane permeabilisation. Bio-Rad recommends the use of Leucoperm™ (Product code BUF09) prior to staining. 1 Results maybe enhanced using membrane permeabilisation. Bio-Rad recommends the use of LeucopermTM (Product code BUF09) prior to staining. Legembre, P. et al. (2005) Amplification of Fas-mediated apoptosis in type II cells via microdomain recruitment. Mol Cell Biol. 25 (15): 6811-20. Li, R. et al. (2014) Human heat shock protein-specific cytotoxic T lymphocytes display potent antitumour immunity in multiple myeloma. Br J Haematol. 166 (5): 690-701. Ouwendijk, W.J. et al. (2014) Functional characterization of ocular-derived human alphaherpesvirus cross-reactive CD4 T cells. Sullivan, E.M. et al. (2014) NK cell genotype and phenotype at diagnosis of acute lymphoblastic leukemia correlate with postinduction residual disease. Clin Cancer Res. 20 (23): 5986-94. Lindqvist CA et al. (2011) Both CD4+ FoxP3+ and CD4+ FoxP3- T cells from patients with B-cell malignancy express cytolytic markers and kill autologous leukaemic B cells in vitro. Holmannova D et al. (2015) Inhibitory CD200R and proapoptotic CD95/CD95L molecules on innate immunity cells are modulated by cardiac surgery. Pachnio, A. et al. (2016) Cytomegalovirus Infection Leads to Development of High Frequencies of Cytotoxic Virus-Specific CD4+ T Cells Targeted to Vascular Endothelium. PLoS Pathog. 12 (9): e1005832.